iMac Shipments Running Low Ahead of Refresh? AppleInsider reports that Apple has begun advising third-party retail partners of impending shortages of the company's iMac models, suggesting that a refresh of the company's popular all-in-one desktop line may be in store for the near future. In particular, a person familiar with the matter says the Mac maker is informing some of its distributors not to expect any further stock of the entry level 21.5-inch, 3.06GHz iMac, implying that production of that model has ceased. Meanwhile, those with ties to the company's stateside reseller channels are being advised to sell through their stock of all existing iMac models and to keep their inventories as lean as possible for the next few weeks. Just last week, Hardmac reported that the Mac Pro would see an "end of summer" update, with iMac updates not following until several weeks after that. The site also claimed that the iMac may gain USB 3.0 and faster FireWire connectivity as part of the refresh. 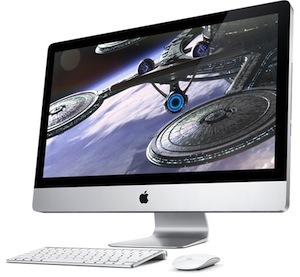 The iMac was last updated in October, when it saw a major redesign to shift to 21.5-inch and 27-inch LED displays.